It’s that time of year again. 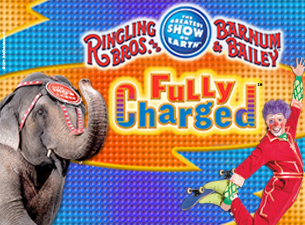 The Ringling Bros. and Barnum & Bailey Circus presents FULLY CHARGED! at the Times Union Center from May 2nd to May 6th. The circus is always super-fun, and I’ll be updating you when I hear more about any circus brouhaha, like parading the animals in, feeding the elephants, and more. And, hooray! Once again, I’ve got two sets of Family 4-packs of tickets to see the show on Opening Night, Wednesday, May 2nd at 7 pm! To enter to win a Family 4-pack of tickets, comment once on this blog post by Friday, April 20th at 5 pm. Now, you can say anything in the comment, but for those who need a topic, hmm. . . . Last time, I asked folks what your act would be if you ran off to join the circus. Which was fun. But I’ve got to come up with something new. So. Imagine that you go to the circus and have a lovely time, but then you and yours are accidentally locked in the circus venue overnight. Where would you choose to sleep, and why? Keep in mind that I’ll choose winners randomly, so you don’t have to sit there at the computer with writer’s block trying to come up with something unbelievably, winningly witty. Just relax and comment. This year, I’m just going to pick two comments randomly, rather than making us all do extra work for a second entry like I did last year. But of course, I still appreciate it, always, when you fill out the Playground Survey: Share Details on Your Favorite or “like” or “share” the Capital District Fun page on Facebook. Perhaps that will bring you just the right amount of karma to win you some tickets? Actually, I’ve been hovering at about 920 “likes” for a while now, and I was thinking that maybe I should promise to do something really silly if I reach one thousand “likes”? Cartwheels through Empire State Plaza? Discuss among yourselves. . . . If the suspense of a giveaway kills you and you just want to just go ahead and buy tickets, you can click here. They’ve got a variety of showtimes, which is good if your kids are usually asleep by 7:30 pm. Whether you win tickets or buy tickets, or if you’re trying to decide whether to go, my review from last year’s circus over on KidsOutAndAbout.com can offer you some insight and logistical advice. Thanks for reading and participating, and good luck! love the circus! always have a great time – make sure you go an hour early for the activities down on the floor – my girls loved meeting the dancers and watching the elephant paint! I guess I would sleep on one of those squishy mats the gymnastics land in from the high ropes. That looks comfy and hopefully away from the tigers. I haven’t taken my kids to the circus yet – this would be so much fun! I would sleep in the big motorcycle ball that I saw in your review from last year. It looks like so much fun! We would probably run around in it like a hamster until we pass out. Would so love to win tix; took my son the last two years, hoping we don’t miss this one! We would sleep anywhere the lions weren’t. Love the circus! I would have to say I would sleep on the comfy mats!!!!!!!! The big net under the trampoline (if they even use a net? ), sounds like a comfy place! I’d sleep with the dogs. They would likely bark if the tigers got out, right? I would probably sleep in a clown car 🙂 just seems fun! I read every blog entry of yours 🙂 hoping to get picked! Hmm… it’s at the TU, so I’m going to lay claim to one of the rooms of box seats! I’d sleep by the Elephants and pretend I was in Dumbo. I remember going to circus with my mom when I was little. I think I’d choose to sleep in the ring so I’d be sure I wouldn’t miss a thing! My grandchildren have never been to the Circus, so we would probably want to sleep in the center ring!!!! I wouldn’t fall asleep but I’m sure all the excitement of seeing the circus will cause my twin daughters to sleep for a long time no matter where they are. Great question…I’m not sure where I would like to sleep…especially after reading and seeing “Water for Elephants.” I hope the conditions are better than in that story. Well, with the toddler the net is out since I think she would slip through…but having once actually slept in a pile of fabric in the costume shop at my college due to an inordinate number of drunk kids pulling fire alarms in my dorm, I’d say fabric in the costume shop!